﻿ NSD Overview｜NSD CO., LTD. Through three core services lines, NSD strives to address the management issues of its customers. NSD provides comprehensive support to ensure the most suitable IT environment allowing customers to further boost their competitive standing and prowess. NSD has continued to develop systems and software which supports the “fundamental platforms” of customers of wide-ranging business types and categories as an independent system integrator for a half century since our founding. Our ability to truly comprehend the needs of customers are the source of our proposal capabilities and qualities of proposal. To date, NSD has accumulated a wealth of experience and abundant track record through the development of more than 10,000 systems. Thanks largely to its proposal capabilities that draw on NSD’s cutting-edge IT knowledge and the active application of high-quality domestic and overseas technologies, we have attracted wide acclaim from many of Japan's leading companies. NSD offers excellent domestic and overseas software including in-house developed products. The Company's lineup extends from versatile all-purpose software through to duty-specific products. Systems engineers account for over 90% of NSD’s workforce. 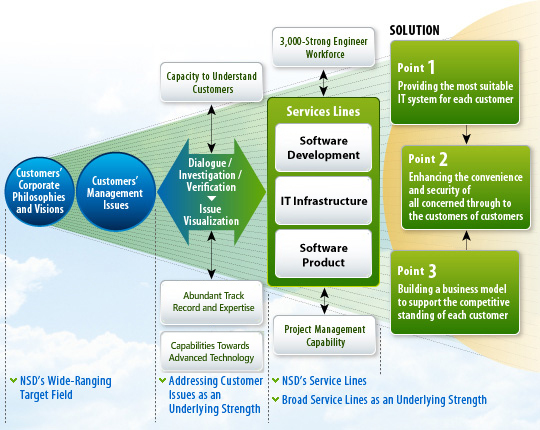 From individual consulting of systems and operations to mission critical large-scale development involving project teams comprised of several hundred SEs, NSD continues to build a structure that is capable of swiftly and flexibly addressing the specific needs of each project and requirement. NSD employs the latest techniques, tools and methodology encompassing such aspects as quality, process, security and systems development to ensure the success of each project. We are making every effort to ensure the complete satisfaction of our customers.